Once again, Katrina Padron and Mariah Danielsen are proving that two heads are better than one. Together they’ve launched 5 businesses and have perfected social media strategies and online marketing for an 80 million dollar company. Impressive, right? Well, now they’re revealing exactly how to turn your passion into profit with their course, the Create + Connect Project. Claim to Fame: Katrina Padron is an ex-Award Winning Director of Marketing for a multi-million dollar company who now helps creative entrepreneurs create social media success. Mariah Danielsen has gone from graphic, web, and marketing guru blogging wedding stylist. This program covers everything! (Seriously, you need to check out the list.) they tell you how to get people on your mailing list, how to connect with your readers in every blog post, how to build the ultimate Facebook page, and how to get testimonials from current clients. They’ve also built in 2 ‘Make It Happen’ weeks’ so there’s no excuse for not implementing everything you learn from these two amazing ladies. What makes the Create + Connect Project unique? Unlike most courses, the Create + Connect Project focuses on video tutorials to help you learn all the juicy tidbit they have to share. Each week’s module is broken down into step-by-step training videos that allow you to easily fit the course into your busy schedule. They take special care to include screensharing (which, let’s be honest, we all love!) and have a ton of resources ready for you. Graduation bonuses! In addition to the group coaching calls, after the eighth week they have 3 live calls with Kal Barteski of Link with Love, Andreea Ayers of Launch. Grow. Joy. and Piper Toth of One Sydney Road. I’ve never seen a program with graduation bonuses. Have you? 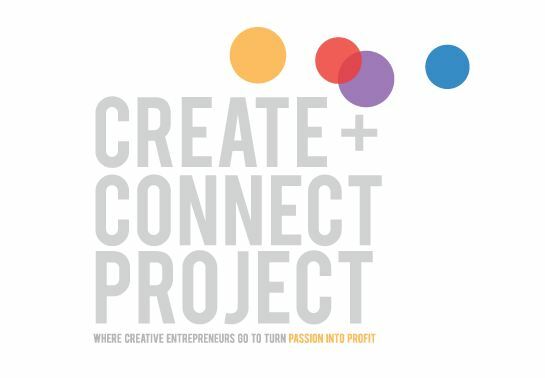 If you’ve been looking for an interactive course that covers everything and provides a great sense of community, the Create + Connect Project is it! I’ve got one more surprise for you: they’re giving away a scholarship to the program!!! You’ll definitely want to check out the complete list for this course to see just how much you’ll learn in 8 weeks. The ladies are positive though that you’ll graduate a marketing guru.